In honor of International Play day 2018, Toybank decided to hold a special play event with the intention of bringing play to a demographic which often gets left out of play. 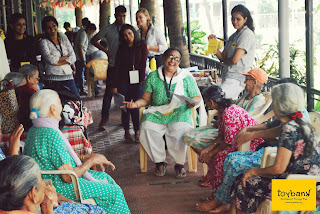 With that inspiration, the Toybank team reached out to the Jivan Asha, a home for elderly residents in Andheri, Mumbai. 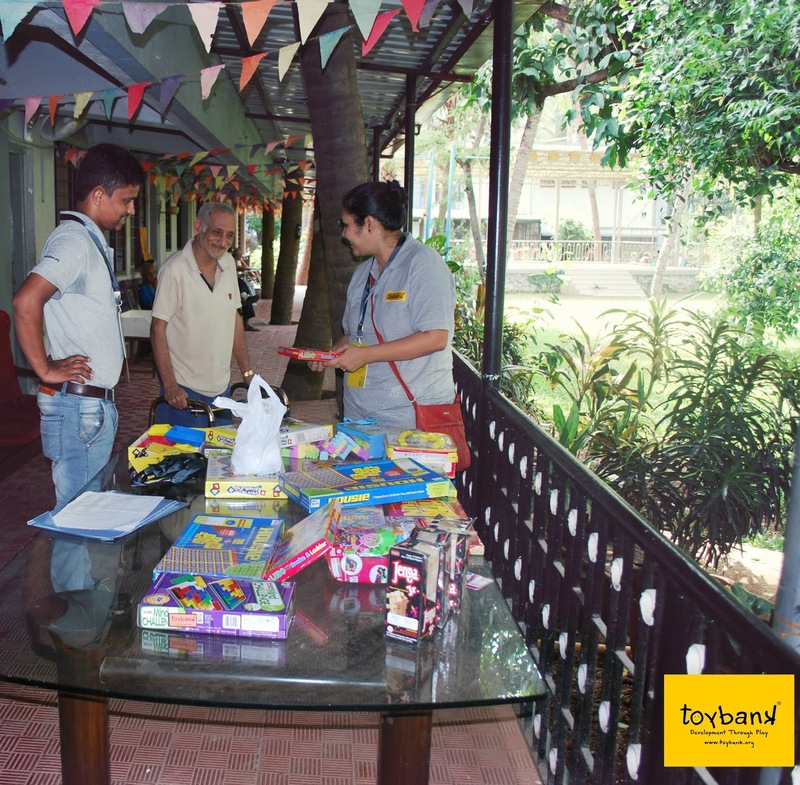 Many of the residents in Jivan Asha are leading lonely and sedentary lives without family visiting them to enrich their happiness; therefore, the Toybank team felt that this particular community needed play. The event was intended to be a day of carefree games and entertainment to provide an oasis of joy and fun for a community of people who otherwise may not experience playfulness in their daily lives. In Shweta’s opening address to the residents, she said “We need to play, we need to have fun!” Capturing the purpose of the event and the spirt of Toybank. Many people who share an understanding about the importance of play came together to pull off a successful play session for the residence of Jivan Asha. As volunteers and Toybank team members arrived, they introduced themselves to new faces and caught up with old friends. Each volunteer happily accepted their roles which were assigned roles which were based on their personal skills and interests that they had expressed to Toybank. Immediately upon receiving their roles, volunteers began passionately collaborating with each other and with the Toybank team to create a set up and a plan which would be effective in constructing the most exciting day possible. While last minute details were being fine-tuned, volunteers began to interact with the residents who had been apprehensively observing the progress from afar. Residents became less apprehensive and more relaxed about settling into our event once volunteers sat down and connected with a few of them. The simple act of initiating friendly conversation offered residents an informal invitation to open up and enjoy the afternoon. 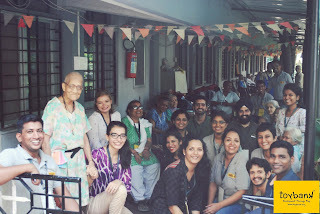 Once everyone was settled in Shweta introduced the event and implored the residents to enjoy themselves (a resident also addressed us at this time with an expression of gratitude). Launching the celebration of play, the volunteer band began with some up-beat Hindi songs and made an exceptional effort to engage an at first inhibited audience. Most residents were still a little shy of us at this point, but a small few of them asked to sing specific songs for the group and show off their passions and talents, giving us a glimpse of the beautiful personalities that were among us. As the main event began, one of the volunteer began storytelling for one group, and other lead the other group in a game of Pass the Parcel (with the help of the volunteer band who performed live music to set a pace for the game). During the game playing and storytelling segments the Toybank team as well as another volunteer, scattered themselves around so they could assist the residents by insuring their comfort and providing simple encouragement and creating a positive and light-hearted atmosphere. As volunteers told stories, lead Pass the Parcel and Bingo, the residents grew exponentially more joyful and engaged. At the start, the residents were inhibited and minimal in their reactions to the events; by the end, they were leaning forward and engaged in their activities, laughing, singing, and clapping. A few elderly women were even chanting and speaking along with the story teller; when the story was completed, the residents where brimming with questions about a magic donkey, a priest, and other characters from the story. The group that played Pass the Parcel moved quicker and quicker has the competition grew eventually laughing and singing and clapping as they achieved success or failure in the game. Likewise, the Bingo players grew more and more excited throughout their game, eventually shouting out numbers that they hoped would be called out and joking about the game being rigged for or against each of them. The event concluded with one last musical performance. This time, the crowed was filled with life and rhythm. Residents, Toybank team members, and volunteers were clapping, and singing along to traditional Hindi songs and yelling out requests. A few cheeky residents ventured as far as to dance, one getting up out of her seat to dance with Toybank team member. After the volunteer band had filled the small crowed with excitement and happiness, some of the residents requested to lead the group in a few songs. One man even composed one just for Toybank and the volunteers, singing “Our hearts are big/ Pockets very small/ Thank you for the love you bring/ May God bless you in everything.” The evening ended with many blessing and gratitude’s shared. At the beginning of the event, the residents came to the event seeming tired and weak and full of inhibition. Toybank left behind happy, relaxed and engaged residents who seemed at least 10 years younger than the ones who apprehensively observed the setup of the event. From only a little engagement in the first musical segment to full participation as the event went on, the residents opened up and thoroughly enjoyed the event.